UNC neuroscientist Spencer Smith creates a new kind of microscope to study the brain like never before. All photos by Spencer Smith. Spencer Smith and the microscope his lab created. Spencer Smith peers through a microscope of his own creation, trying to home in on a single neuron. The cell is tiny, about 0.015 millimeters in diameter. He attempts to clamp a microscopic pipette directly onto the neuron’s dendrite—an arm-like extension of the cell. He wants to explore its function in greater detail than anyone has ever done. It’s tedious work that requires otherworldly patience, a lot of time, and a powerful microscope. Finally, Smith manages to connect the pipette. Then, he listens and he looks. Eventually, he witnesses a spike of current. The dendrite in the brain of a live mouse has fired an independent electrical signal. The signal wasn’t created elsewhere—it originated in the dendrite. 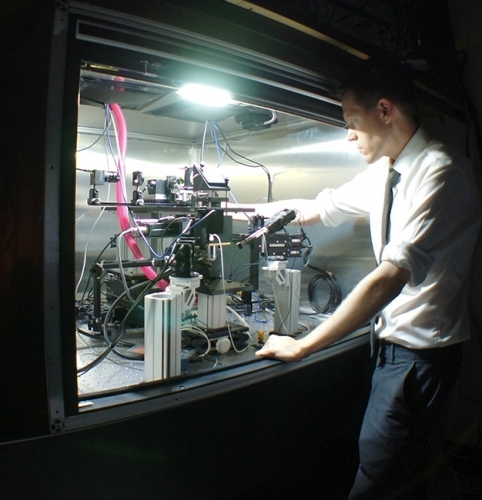 The lab used its new microscope to find that dendrites can fire their own electrical signals. To a neuroscientist, this is big news. Dendrites were supposed to be mere passive circuits that transmitted electrical signals from synapses to the main cell bodies of neurons. Smith’s research shows that when a mammal is making sense of visual information, dendrites can actually create signals to process that information themselves. Turns out, dendrites aren’t just wiring in the brain. They’re like mini-neural computers. Imagine you’re reverse engineering a piece of alien technology, and what you thought was simple wiring turns out to be transistors that compute information, says Smith, a neuroscientist at UNC. “That’s what this finding is like.” Except we’re talking about the mammalian brain. Smith’s work, which was published in the journal Nature, could provide scientists with insights into brain-related conditions, such as Timothy syndrome, a rare genetic disorder in which dendritic signals seem to go awry. And the research is changing the way scientists think about long-standing scientific models of how neural circuitry functions in the brain. This summer, two major funders of neuroscience—the National Science Foundation (NSF) and the Simons Foundation—have turned to Smith to develop experiments to explore the brain with a new kind of two-photon microscope. His work is part of the BRAIN Initiative, which President Obama announced in 2013 with the ultimate goal of mapping every neuron in the human brain. Smith has already created a prototype and is on the way to seeing, in detail for the first time, how neurons interact across different brain areas while processing visual information. Typically, the visual cortex does its thing through the power of axons generating electrical spikes, which indicate that the neurons are processing the information we take in through the eyes. That is, when we read, axons fire, and then we understand, we think, we form new ideas. But Smith knew that many of the same molecules that support axonal spikes are also present in dendrites. Previous researchers used dissected brain tissue of mice to show that dendrites can use those molecules to generate electrical spikes—at least in a dish in a lab—but it was unclear whether normal brain activity in live animals uses those dendritic spikes for anything meaningful. For example, could dendritic spikes be involved in how we see and how we process what we see? The answer, Smith’s team found, is yes. Demonstrating this required a series of intricate experiments that took years and spanned two continents, beginning in Michael Häusser’s lab at University College London, where Smith was a postdoc before joining the UNC faculty in 2011. Smith’s team, including his wife Ikuko Smith, used patch-clamp electrophysiology to attach a microscopic glass pipette electrode—filled with a salt solution similar to that in the brain—to a neuron’s dendrite in the brain of a mouse. The idea was to listen in on the electrical signaling process. Spencer Smith’s brain-research lab needed a new microscope. So, they built one. That’s where the two photons come in. To take images of what’s going on in a neuron, Smith uses bursts of light so intense that the cellular molecules absorbing that light can’t tell where one photon in the beam of light ends and the next one begins. The molecules absorb two photons at the same time. “That’s key to this kind of imaging,” Smith says. Brain tissue is a thicket of neuron branches and other cells that conventional microscopes can only reveal in blurry images. 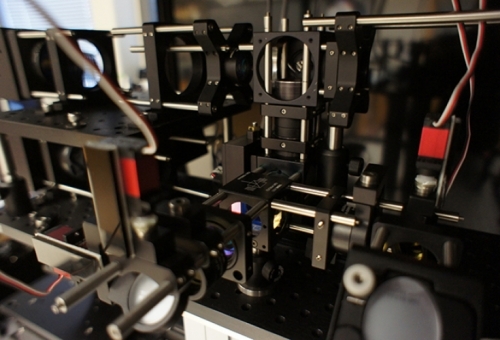 Two-photon microscopes can generate sharp images and reveal fine neural structures. It’s his microscope’s design that makes this sort of brain research possible. Once the pipette is attached to a dendrite, Smith’s team takes electrical recordings from individual dendrites within the brains of anesthetized and awake mice. As the mice view visual stimuli on a computer screen, the researchers can see unusual patterns of electrical signals—bursts of spikes—in the dendrite. Further work revealed that the dendritic spikes occur selectively, depending on the visual stimulus, indicating that the dendrites process information about what the animal is seeing. To provide visual evidence of their finding, Smith’s team fills neurons with calcium dye, which allows for an optical readout of spiking. This shows that dendrites create electrical spikes, while other parts of the neuron do not, meaning that the spikes are the result of local processing within the dendrites. They themselves are computing visual information. “It’s as if the processing power of the brain is much greater than we had originally thought,” Smith says. This work was done with his first iteration of a two-photon microscope at UNC. Version 2.0 is now under construction for a different kind of brain exploration: to record the activity of individual neurons in different parts of the visual cortex at the same time. This has never been done before. It would allow researchers to see how different neurons interact while the brain processes information during normal conditions or disease states. To accomplish this, Smith needed to build a microscope from scratch. His lab is designing their own lens systems for the magnifying optics—stuff scientists typically buy off the shelf. Smith looked into outsourcing the optical design work, but that process was extremely slow and expensive. “So I figured we could do this ourselves,” he says. The National Science Foundation funded him to the tune of $300,000 as one of 36 recipients of an Early Concept Grant for Exploration Research (EAGER), and the Simons Foundation gave Smith and Princeton researcher Jonathan Pillow a $540,000 grant for three years. Smith’s idea was to create optics and a complete magnifying system that would allow scientists to view neurons throughout the entire visual cortex of a mouse, which includes multiple brain areas. This would show researchers which neurons—and which kinds of neurons—fire as a result of visual stimuli or specific behaviors of the animals. The visual information produces neural activity that’s distributed across multiple brain areas. Scientists can use nuclear magnetic resonance imaging to see which parts of the brain light up, but such magnetic methods don’t offer high-resolution images of individual neurons. Smith wants to put visual stimuli in front of mice and then study their neurons to see how they fire, when they fire, why. He wants to map the interactions between neurons in the visual cortex. Scientists have made significant advances in understanding the pathology of certain brain disorders by linking a gene to a molecule and, then, to the faulty activity of synapses between neurons. But, Smith says, what happens to neural circuitry throughout the brain during these diseases remains poorly understood. “Down the line, we hope to address this,” Smith says. 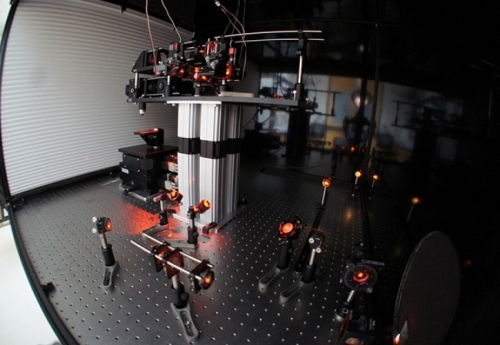 Smith’s first two-photon microscope was designed to view individual neurons firing over an area of 1.4 millimeters. This success proved the general approach, and his lab immediately went to work to push the envelope. When he proposed to build a microscope with a field of view of at least 3.5 millimeters, which would allow him to view neurons throughout the entire visual cortex of a mouse, one grant reviewer was skeptical, saying that if this were possible, surely someone would’ve achieved it by now—especially a microscope company. Luckily, the other grant reviewers disagreed with their colleague and agreed to fund the project. Smith set out to design the first system to view individual neurons firing over a span of 3.5 mm, and came up with a prototype that proved his concept was feasible and proved that skeptical reviewer wrong. He enlisted the help of Jeffrey Stirman, a UNC bioengineer in his lab, and Mike Kudenov, an optics expert at NC State. The team is designing precisely what Smith knows he’ll need to increase his field of view in the visual cortex while also improving the resolution of the images of the neurons. Smith plans on finishing the construction of the microscope in the next two years. Mark Derewicz is the science communications manager at the UNC School of Medicine and UNC Health Care. Spencer Smith is an assistant professor in the Department of Cell Biology and Physiology in the UNC School of Medicine and a member of the UNC Neuroscience Center and the Carolina Institute for Developmental Disabilities. Ikuko Smith and Jeffrey Stirman are postdoctoral fellows in Smith’s lab. Mike Kudenov is an assistant professor of electrical and computer engineering at NC State. To create his first two-photon microscope at UNC, Smith used a $300,000 grant from the Human Frontier Science Program, an international research organization funded by fourteen countries, including the United States, and the European Union. The NSF issued 36 EAGER grants to researchers working to create technologies that will allow scientists to better understand how complex human behaviors result from neural activity inside the brain. The grants, totaling $10.8 million, were made in support of President Barack Obama’s BRAIN Initiative, a multi-agency endeavor with the goal of creating neurotechnologies to help scientists open new areas of investigation into how the brain works.